This post was much better the first time I wrote it, but then it was eaten by the Great Firewall of China. I’ll try to rewrite it but frankly, I am so annoyed and frustrated and TIRED of this ridiculous censorship and the fact that I have to use a special program just to see my own damn blog that I feel like revealing all of China’s state secrets right here, today. But I won’t. Everyone already knows about them, anyway. Instead, I will tell you about eating out at Pizza Hut. Because what is more hard-hitting: exposing China’s corruption and propaganda or discussing the insidious infiltration of Western fast food chains? So it was with curiosity and a pizza craving that we set off to see Pizza Hut for ourselves. Kunzilla was right. Pizza Hut is a high-class joint in China. All the Linyi elite were there. The whole place has the feel of a fancy European cafeteria. I even felt a little under dressed. The menu is very familiar. All the usual chain restaurant appetizers and salads are there with the pasta dishes and pizzas you’d expect to find. The biggest difference is in the portions. The small pizza is 9″ and the large 12″ and that is it. No mega-super-sized pizzas or drinks on offer here. We had fried calamari, (no joke about the small portions, there were literally three or four rings!) two pizzas – one “edge” style without crust and one “pan” style, and a cranberry crisp cheesecake for dessert (again, a completely normal sized portion for most of the world, but an American would have asked to see the manager.) The food was as expected. It must all come from a central processing plant, anyway, as it all tastes the same everywhere. I’ll admit I enjoyed the pizza. Pizza is such a great food. How can you go wrong with bread, cheese, pepperoni and veggies, and you can eat it all with your hands! Yes, you are supposed to eat pizza eat with your hands. I stand firm on this. The biggest shock, of course, came with the bill. Eating out in Linyi is super-cheap. You never have to cook a single meal if you don’t want to, since eating at restaurants and noodle shops will set you back the same or less amount of money. The DH and I regularly spend less than $10 for dinner. Our bill (we splurged) came to 230RMB (20 Euros or 31 USD). !!???!!! Twenty Euros for a two-person meal!!? (Well, we did have leftover pizza for brunch the next day.) Outrageous! My recommendation for the best pizza in China is The Tree in Beijing. They offer thin-crust, wood-fired pizzas, pasta, sandwiches, great Belgian beers and free wi-fi. Located in the Sanlitun area, close to the embassy district, you will definitely pay Western-style prices for food and drink, but it is fresh, delicious and unique. Of course, the best pizza in Linyi is still to be found at my friend L’s house. She makes it from scratch. What Could I Possibly Title This Post? So the DH was in Beijing last weekend, and he ate out at Hooter’s with a few friends. I don’t condone Hooter’s. I think it is a bit tacky and it isn’t exactly my idea of an upper-class family restaurant either, but in Beijing apparently that is what it is. The DH reports that in addition to the expected Hooter’s girls (though I don’t see how they can keep those costumes going over the cold Beijing winter) there were also kids celebrating birthdays and couples obviously on dates. Back where I come from, Hooter’s is a novelty. It’s basically a sports bar for men and people who like chicken wings. Isn’t it? Come to think of it, I’m pretty sure I’ve only ever been in one before and that was because of the roof-top patio. For some reason, talking about Hooter’s, I am reminded of the most politically-incorrect restaurant ever seen in a conservative Arab country – Chi Chi’s, a Mexican restaurant that was hugely popular in the Kuwait of my youth. As I recall, it was pretty much the only Western style restaurant, other than Sizzler’s and fast food. And no, I didn’t speak Spanish at the time. So is this the kind of face that America is spreading around the world? Hooter’s and Chi Chi’s? Note that I am not a parent, so maybe I don’t have the right to judge, but I think this article is incredible, and should be read by everyone who has kids. Because kids cannot live by chicken fingers and pizza and french fries alone. This is not how I was raised, how about you? 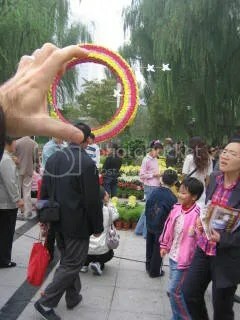 An expat friend here once told me that his life in China was basically wasting time between big meals. While I wouldn’t say that is descriptive of my life, I can definitely relate. One of our most common recreational activities is eating out. There is just so much good food to be eaten, and at Chinese prices you can’t say no. Last night I ate at a XinJiang people restaurant. XinJiang is China’s most Westerly province. It is harsh desert land and is populated by people descended from the Turks. They are also called Uyghur people. 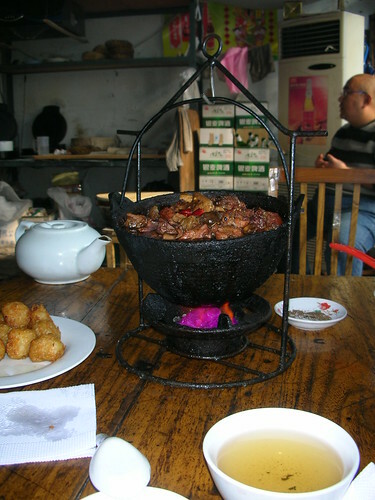 Uyghurs are Muslim and they are famous throughout China for their barbecue and meat dishes. 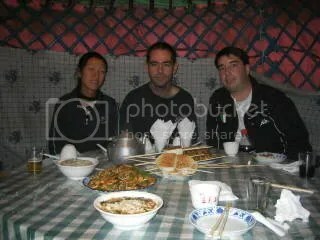 You will not find pork in a XinJiang restaurant, but you will find amazing kebabs and beef & lamb. I don’t have any pictures, but try to imagine this. The night air is cool, a welcome relief from the high temperatures we have been experiencing lately. We sit outside, where there are a few tables set up on the sidewalk. There is a speaker next to the table blasting Uyghur music – very reminiscent of Middle Eastern music. We are five people – three of which are known for their hearty appetites. (Two Chinese, One Brit, One Spaniard & One American.) Food is ordered on a very empty stomach – maybe not a good idea. Before long, the entire table is covered in food. (Literally!) A plate of empanada like bread pockets with lamb & onion inside. A plate of raw garlic. A plate of french fries XinJiang style (Fries covered in a popular spice mixture). A plate of lamb kebabs. A plate of stir-fried beef with chilies and vegetables. A plate of stir-fried lamb with vegetables. Another plate of stir-fried lamb with vegetables (but different from the other). A plate of deep fried lambchops. A plate of thinly sliced lamb with croutons (so much better than the description). A plate each of chewy noodles with vegetable topping. 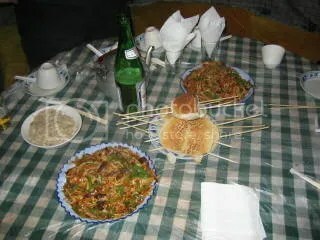 A plate of XinJiang bread. Tea and beer all around. Are you getting the idea that there was a lot of food? 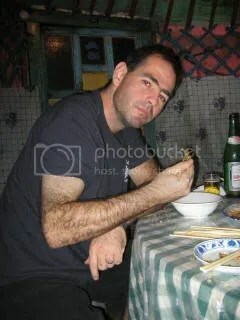 What was interesting about eating in a XinJiang restaurant for me was that even though we were in China, with two Han Chinese and altogether three people who speak Chinese, there was still some communication problems. Uyghurs speak a different language entirely and may not be very fluent in Mandarin. It made no difference to me, since I speak neither Chinese nor Uyghur, but it seemed odd that our Chinese friends also had difficulty. 4 Stars for the XinJiang restaurant. Looks even better now that there is some sort of pig disease driving up the cost of pork in China. 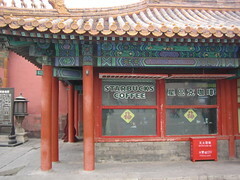 The controversial Starbucks outlet located in the heart of Beijing’s Forbidden City, otherwise known as the Palace Museum. Since the internet has been on the fritz, I’ve been reading a lot of the China Daily, the English language Chinese newspaper and website. Most of the stories seem quite sanitized for our reading pleasure, but when it is the only website that loads in less than 2 minutes, it’ll work. I’ve noticed a few articles lately about the Starbucks outlet in the middle of the Forbidden City. It seems a popular TV host complained about it on his blog, and other Chinese took notice. Now there is a public debate happening about the shop. 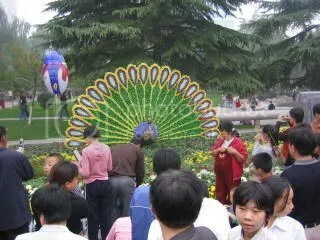 Some people say it is an insult to Chinese culture. They make a good point when they ask if Starbucks has plans to put an outlet in the Taj Mahal or the gardens of Versailles. On the other hand, some people say that Starbucks serves a purpose and hasn’t changed the overall look of the building it is housed in. 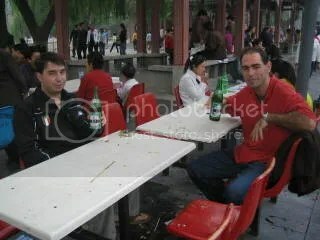 In fact, it was the Palace Museum management that invited Starbucks in. There are lots of other vendors inside the grounds of the museum selling food, water, instant coffee & souvenirs. I took this photo in January 2006 on my first visit to the City with the DH. At that time we had already been in China 5 months and the thought of a Starbucks coffee sounded pretty good to us. I think I got a Chai Latte and the DH an espresso. We sat on a bench in one of the courtyards, admired the architecture and enjoyed our drinks. I’ll admit we were both a bit shocked when we first saw it. It seemed ironic that in the heart of the “Forbidden City” a potent symbol of Americanization and capitalist culture thrived. Inside the tiny shop we saw a European family, a couple of backpacker types reading and a handful of Chinese tourists. An art shop is attached to the coffee shop selling University student artwork, original paintings and art books. 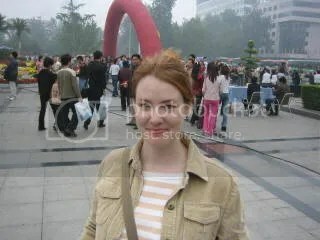 On my second trip to the Forbidden City, in June 2006, I got my latte-addicted sister-in-law giddy at the thought of a mid-morning Starbucks pick-me-up. But when we arrived at the area I remembered the store, it seemed to be closed. Evidently not, since the newspaper say it has been doing business there for 6 years. According to the news articles, the museum officials will decide by June 2007 if the store can continue in its present location. For better or worse, I’d bet they say yes. Christmas is a low-key holiday for the DH and I, it always has been. We tend to observe both Christmas Eve & Christmas Day quietly without much fanfare. DH is from Spain and in Spain, Christmas Eve is the time for celebrating. Christmas Eve in Spain is spent over a big dinner, usually made up of seafood riches, with all the family around. These dinners start around 10PM, the usual dinner time, and can last for hours. The kids wait eagerly for midnight, when they may get a present or two from Santa Claus. However, this is a new idea. Traditionally children in Spain receive gifts from the Three Kings on January 6th – Día de los Reyes. After dinner, many people get together with their friends in the streets & bars to have a few Christmas toasts. Nights in Spain last well into the morning, and this is no exception. Christmas Day is a time for rest! As an American, I’m used to celebrating on Christmas Day. My family did it the traditional way – excitement and an inability to fall asleep on Christmas Eve followed by an early morning wake-up to rip through the packages under the tree. We’d have a big lunch and then nap throughout the afternoon. Periodically my Dad or Mom would have to work, so sometimes our traditions changed. It didn’t really matter, the day always turned out great in the end. This year we had our Christmas Eve feast in a small, humble Linyi restaurant. 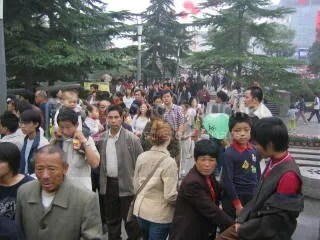 (It was so crowded when we arrived that we had to go shopping and come back in an hour just to get a seat.) I think we are going to start calling it the “Cauldron Place” because we ate a delicious, bubbling brew of a stew from a small, black cauldron. The stew was made up of beef and carrots and had a really intense flavor. Perfect for winter. DH ate there last week and kept going on and on about the stew, so I made him take me there. The manager/owner, a round & bald Buddha look-a-like, remembered him and understood our ordering charades. The cauldron. In the background, the smiling Buddha and the bread making station. When I say humble, I mean really humble. The first view on entering is a bread making station, and six dining tables to the left. In the back there is an entrance to the kitchen and a small desk where a girl sits ready to take payments. The bread making lady was interesting to watch. She had a huge terracotta bowl that she filled with flour and water and kneaded to the right consistency. She fashioned small rounds of dough and cooked them on two hot plate presses that reminded me of waffle makers without the bumps. The bread emerges flat and round, like a pita. It reminded me of the naan of India and the Middle East. 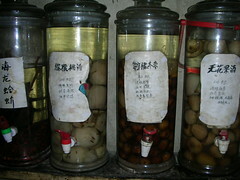 The corner wall behind the desk was devoted to bottles of homemade liqueurs. On his first visit, the DH tried one that reminded him of a popular Spanish liqueur made from herbs. 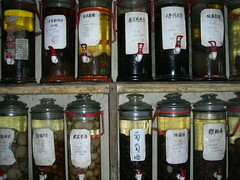 The bottles are filled with various foods, herbs & spices, many of which I couldn’t identify. Several customers ordered shots of the liqueurs but we decided not to. At our Muslim Meat dinner with Mr. W, we tried a liqueur made to “increase male strength” made up of, ahem, animal penises. I took a sip and was not impressed. I think I’ll leave the liqueurs to those who know what they are made of! The rest of our Christmas Eve was spent drinking coffee and reading magazines at Coffee Language and doing our grocery shopping. 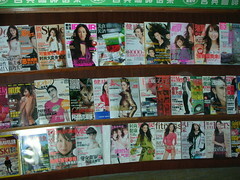 What I love best about Coffee Language – the Chinese Magazine Wall! As for gifts, today we received presents from the company and students: boxes of Dove & Cadbury chocolates – yummy. Yesterday while walking down the street, we were stopped by a tall, skinny Chinese Santa who presented us with carefully wrapped apples, to the amusement of everyone on the surrounding sidewalks. As for the DH and I, our best gift to each other is always the ability to be together on Christmas! Our Chinese friend, Mr. W., invited us to eat Beijing duck with him last night, but because we arrived fairly late, the restaurant was closing. We sped off to what Mr. W. promised would be a delicious meat feast, instead. We weren’t disappointed. The restaurant was almost empty but they welcomed us anyway and before I could even take my coat off several dishes began appearing at the table. (Food always comes fast and hot in a Chinese restaurant.) We had calamaris, mushrooms and beef, marinated beef with green peppers (so good! ), a dish which looked to me like hot chilis with more hot chilis (super hot), and the highlight – one of the best things I have ever eaten – a whole leg of small lamb, served Fred Flintstone style. The waiter brought me some plastic gloves so I wouldn’t get dirty because this is not something you eat with a knife & fork or chopsticks. You eat it with your hands like the hungry caveman/woman you are. It was delicious. The meat was so tender it just fell off the bone and melted. The whole leg was covered in a hot spice mixture that is very commonly used in the Chinese Muslim and Mongolian cooking. I like that kind of spice so it didn’t bother me, but it did get hot towards the end. I’ve never eaten lamb like that before. I have to say it was the best I’ve ever tried. Of course this is the night that I left the camera at home, so you’ll just have to use your imagination. The night was a really special treat for DH as lamb is his most favorite food on the planet. When I glanced over at him, happily devouring the meat off a leg that he held in his hand, I knew he was in heaven. As we were leaving, the owner or manager (I’m not sure who he was.) invited us to come back later in the week for the 18th anniversary party of the restaurant. He promised delicious food and gifts for us! Last night the DH and I went to the local Coffee Language to check out the food and ambience, part of our ongoing Grand Tour of Linyi. 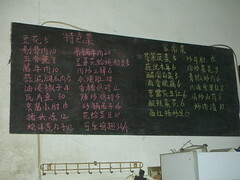 The Coffee Language is located right off of the People’s Square, which is pretty much the heart of Linyi. We orderd a “company sandwhich,” fried rice with beef and some spaghetti. Everything turned out to be quite delicious. I am often weary of sandwhiches in China because the kind of bread they use is normally sweet, adding an element to the sandwhich I just don’t like. But the company sandwhich – well this is a sandwhich I could eat everyday. It’s basically a club sandwhich with tomatoes, pickles, ham, egg and bacon. And surprise, surprise, the meat didn’t taste sweet, either. (Chinese ham is often sweet.) The spaghetti was good with a thick tomato sauce studded with carrots and beef. The fried rice tasted fresh and faintly nutty. To end the meal the DH ordered espresso and I ordered hot ginger cola. What is that, you ask? Heat up a can of coke, throw in some shredded ginger root, let it steep and there you go. It tastes sweet and slightly peppery and is excellent for your stomach. I first tried it in a Tibetan restaurant in Southwest China and I have been craving it ever since. After dinner we walked across People’s Square to observe the huge groups of hundreds of people dancing together. Some were line dancing, some were doing traditional Chinese style dancing and others were ballroom dancing. We are talking crowds of hundreds of people, in a park, at night, in the cold, dancing. I cannot in a million years imagine that happening in America. P.S. American T, if you are reading this, we were thinking of you at the restaurant because they kept playing “Tennessee Waltz” on the sound sytstem all night. I was just checking through my bookmark folder when I came across Photobucket – an image hosting site. I had forgotten that last year I created an account and uploaded some photos. I remembered that I had uploaded them, but then lost track of them. So here they are! 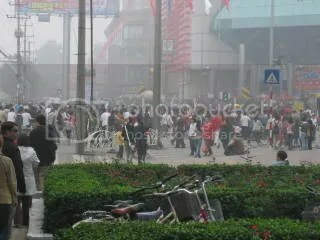 These pictures were taken on 1 October 2005, China’s National Day, in Shijiazhuang, China. We (DH, American T & Me) spent the day in the park – being stared at, eating weird things on a stick, and chatting with a little Chinese girl. Our table in the park where we chatted with a little Chinese girl in English. She ordered her father to buy us beers! The DH digging in. He is quite handy with the chopsticks! McDonalds has conquered the world, this we know. There is hardly a spot left on the planet where you can’t find McDs, Starbucks (or fourbucks), or Pizza Hut. In China, the McD workers get to wear special McJeans. Do your local McD employees wear them? These photos were difficult to obtain. I don’t know if it is Chinese paranoia about taking pictures or McDonalds’ paranoia, but if you whip out a camera in a Chinese McDonalds you are going to have problems. Someone told me it was because they didn’t want people taking pictures of the prices. (Maybe the workers just don’t like people taking pictures of their bums.) I stealthily snapped these pics on my phone, which is why they are not stellar quality. Incidentally, fast food places in China are always packed!